ODTV's first official episode is here! For their maiden voyage, Ky, Faith, and Frank give a running commentary of Joss Whedon's internet sensation Dr. Horrible's Sing-Along Blog! Whether you're a Dr. Horrible expert or you're watching for the first time, sync up with us and enjoy! 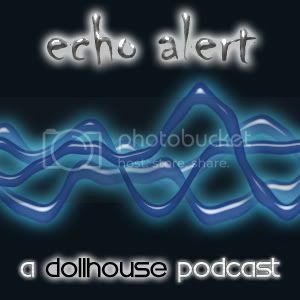 Announcing Echo Alert: A Dollhouse Podcast! So apparently not even two podcasts are enough for me. My addiction for podcasting and my interest in a particular new TV show brought me to the realization that it was time to start a third show. My friend Andrew and I have teamed up to bring you Echo Alert, a podcast devoted to Dollhouse, Joss Whedon's new FOX series starring Eliza Dushku and Tahmoh Penikett. Dollhouse looks like such a promising new show that Andrew and I know we'll love it. Each week, we'll discuss the show at length, giving you a recap of the most recent episode and providing our own commentary while speculating on what twists and turns the show may take in the future. At the very end of each episode, there will be a spoilers discussion. Don't worry, there will be plenty of warning before we start talking spoilers. So please, if you have any interest in Dollhouse, or even if you just want to find out what the show is all about, download our Episode 0 Part 1 entitled "Activated." It's a Dollhouse joke. You'll get it eventually. Download Episode 0 Part 1 "Activated"
Wow. I have been -- to put it in my friend Andrew's words -- " a podcasting fiend" lately. Seriously. My name is Frank and I'm a castaholic. Listening to them, recording them, I just can't get enough. It's an exciting medium that I think has amazing potential. For two and a half years now, I've run Frank's Music Free-For-All. About three weeks ago, I teamed up with my friends Tim, Ky, and Faith to create the Obiter Dictum podcast, a TV fan commentary show. And most recently, the aforementioned Andrew and I have started Echo Alert, a podcast devoted to the upcoming Joss Whedon and Eliza Dushku series Dollhouse. Today, I had the pleasure of sitting in on the Entertainment Overload podcast and the Geekland podcast at the gracious invitation of my Twitter friend Willie. Entertainment Overload is a podcast reviewing TV, movies, video games and other entertainment. We had a great time talking about this week's TV and movie highlights. Smallville, LOST, Scrubs, and Taken were among the many topics discussed. Check out the guys and listen. Then, on Geekland, we talked comics. I really had a blast with this one, since comics have been a new passion for me. We covered Superman, Final Crisis, Spider-Man, Green Arrow/Black Canary, Trinity, and whole host of other titles and trade paperbacks that we all read in the past week. If you like comics, please listen to Geekland. I started listening a couple of weeks ago and I honestly think the guys have a great show here. So that's what I've been up to lately. There should be a new ODTV and FMF out this week, and a new Echo Alert after next weekend. February 6-8 I will be at New York Comic Con with my friends Andrew, Tim, and Vin. It should be a good time. During and after the convention, I'll blog my reactions to the panels and other goings-on. We plan to attend the DC Comics panels as well as a few others, including the Dollhouse panel where show creator Joss Whedon and star Tahmoh Penikett will screen the first act of the show's first episode. So that should give us plenty to discuss on Echo Alert. See you in the podcastverse! Announcing the Obiter Dictum Podcast! Well folks, one podcast just isn't enough to keep me overwhelmed. A few friends and I have teamed up to form a brand new podcast that we like to call "Obiter Dictum." What is this, you ask? It's going to be a fan commentary podcast. We'll be watching our favorite TV shows and providing a running commentary along with the episodes for your entertainment. We'll cover shows like Smallville, Lost, Supernatural, Buffy the Vampire Slayer, Angel, Terminator: The Sarah Connor Chronicles, Heroes, Firefly, and much more! Our first official episode will cover Dr. Horrible's Sing-Along Blog! I say "official" because we've already put out a miniature episode we've called #0 in which we explain the premise and introduce ourselves. I am joined by my friends Faith and Ky of the Chic Geek Podcast and Tim of the Crossroads Podcast. (Support them by checking out their shows in my Linkage section over in the right-hand column). Download Episode 0 - "A Microcast"
Podcastin' Part 6: Speeding Bulletin and Radio K.A.L. Each Thursday night, after Smallville has already aired, I look forward to downloading the newest episode of Speeding Bulletin. The first segment of this weekly video podcast is hosted by the Superman Homepage's webmaster Steve Younis. Speeding Bulletin provides viewers with a weekly summary of Superman news from the past 7 days. It's a must-view for any true Superman fan, as it covers news of upcoming comics, TV, movies, and fan events, such as charity events and conventions. If you want to know what's going on in the world of Superman, this is the show to watch. Once Steve has covered all the news, his friend and Superman Homepage contributor Neal Bailey gives a quick rant about some piece of Superman news that has caught his fancy. He is hilarious and his immense knowledge of all things Superman make his segment extremely entertaining. Speeding Bulletin averages 10 minutes in total between the two segments. Once a month, Steve and Neal team up for an audio podcast called Radio K.A.L. In this show, they pick 3 or 4 recent Superman headlines and discuss them at length, giving their personal opinions and insights on the topics at hand. Other segments include reader e-mails, a monthly contest, and the presentation of a Superman-related song, usually something by a little-known independent band. Radio K.A.L. along with Speeding Bulletin are essential for Superman fans who like to keep up with current goings-on. Both shows receive 5 out of a possible 5 celophane Superman shields and the coveted Frank Ramblings Seal of Approval.